Precision Aerobatics planes are lined up and ready to fly on Sunday of the 2016 Stunt-a-Thon. Flying Lines photo. 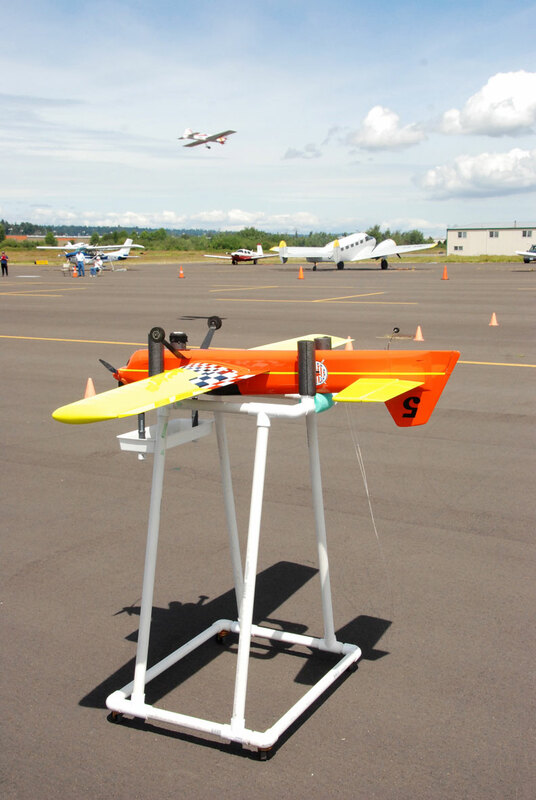 June 11-12, 2016 Auburn Municipal Airport, Auburn, Wash. 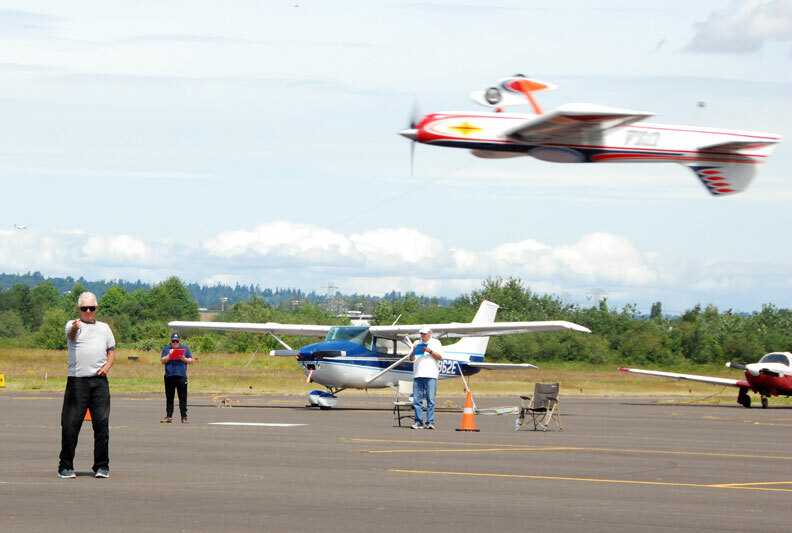 The 35th running of the Northwest's June stunt contest, sponsored by the Northwest Skyraiders, went off smoothly in mild temperatures, partly cloudy/partly sunny skies and variable winds (a bit stiff and turbulent on Saturday, steady and mild on Sunday). Attendance was down a bit from the usual turnout, particularly in the Saturday preliminary events. Nevertheless, it was an enjoyable celebration of aerobatics finished off with attractive framed trophy certificates featuring photos of the winning pilots and their airplanes. 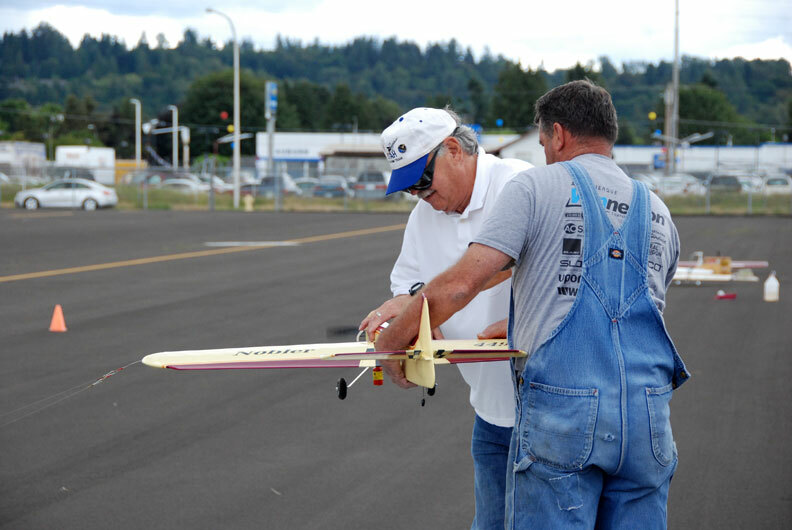 Dave Gardner was the contest director, assisted by high-tech tabulator Howard Rush and other Skyraiders members. 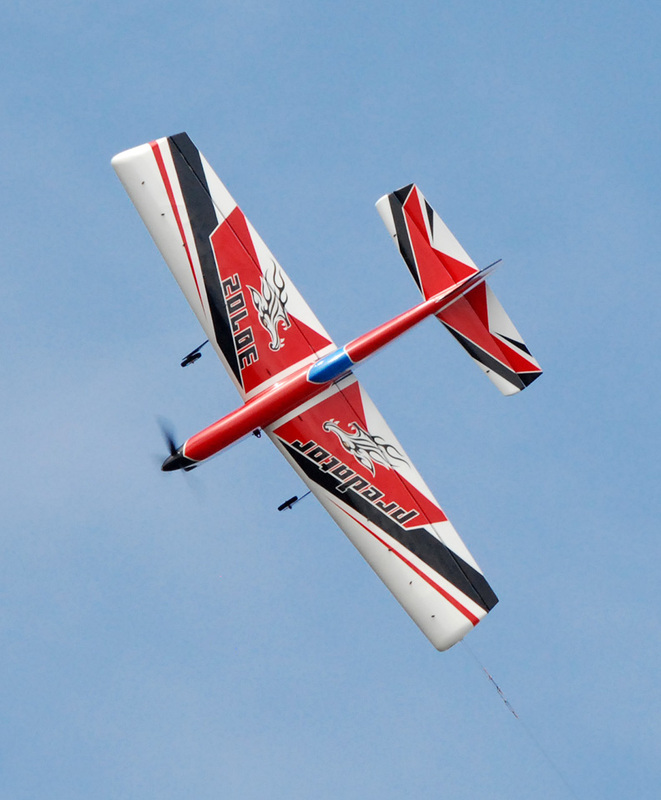 Paul Walker's Predator makes the winning flight in Expert Precision Aerobatics. Flying Lines photo. The Predator, recently back from the world championships, glides in for its landing. Flying Lines photo. 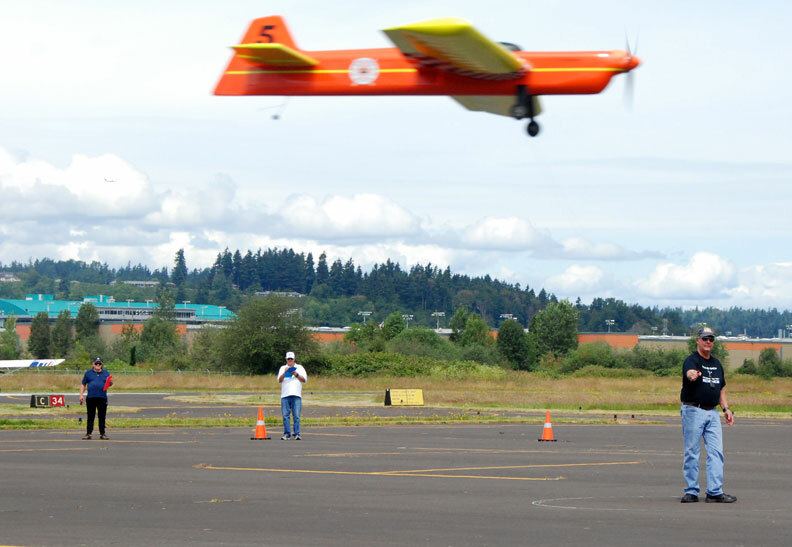 Chris Cox launches the Predator. Flying Lines photo. 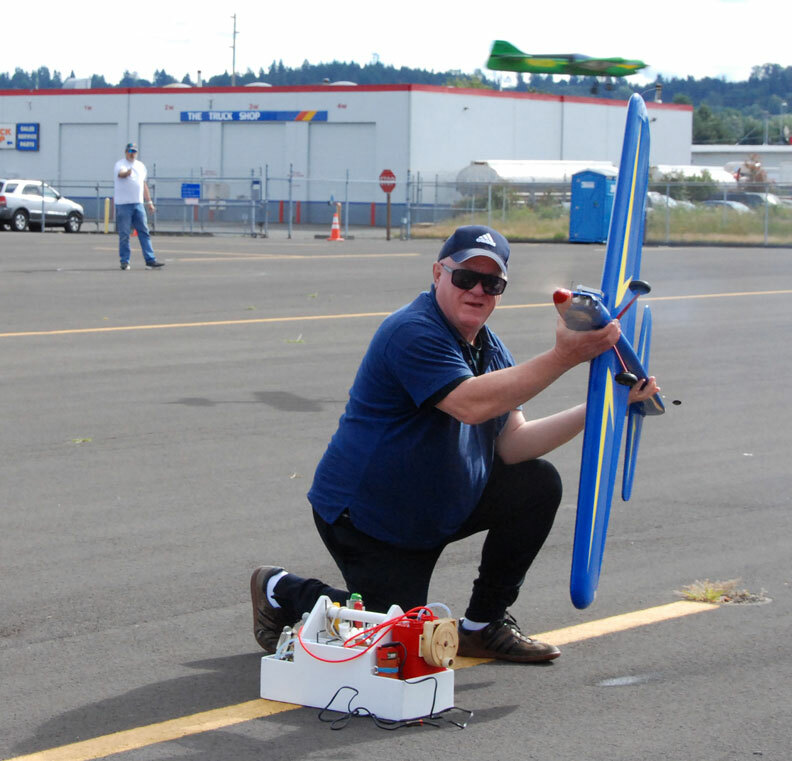 Pete Peterson starts the engine on his Nobler for the winning flight in Classic Stunt. Flying Lines photo. 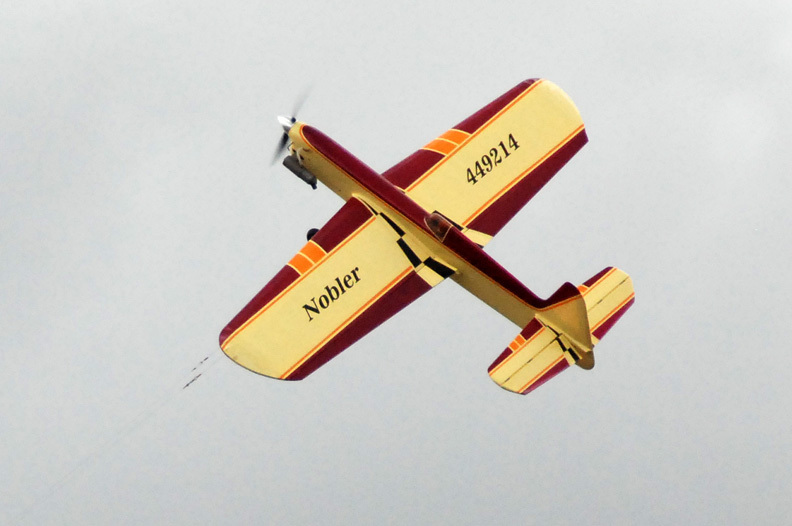 Pete Peterson's Nobler in flight. Flying Lines photo. 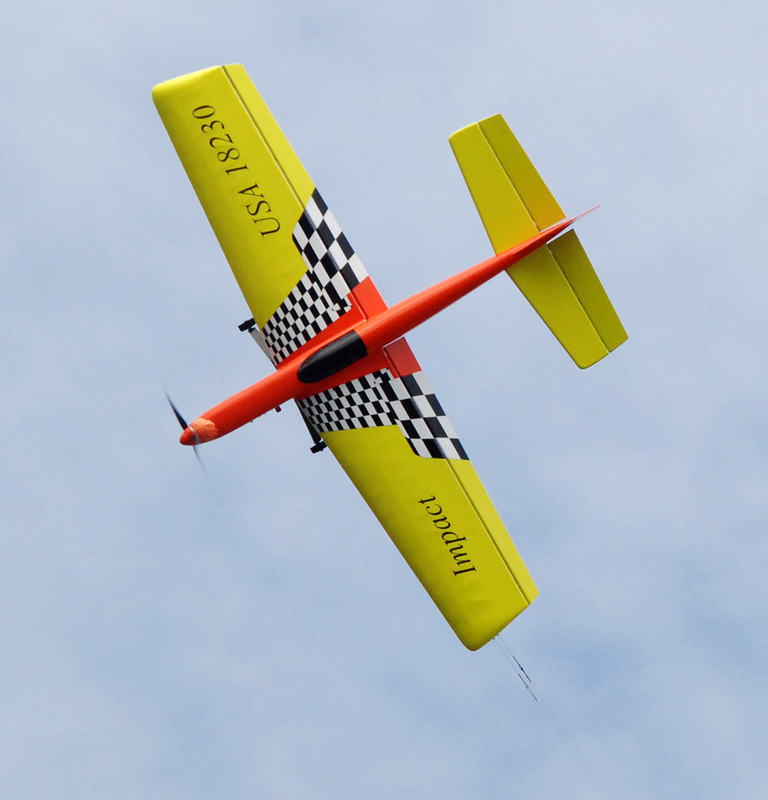 Addis Elmore, who recently moved to the Northwest from Texas and also recently resumed control-line flying after a long layoff, tunes up his Letha before making the winning flight in Advanced Precision Aerobatics. Mark Scarborough practices in the background. Flying Lines photo. 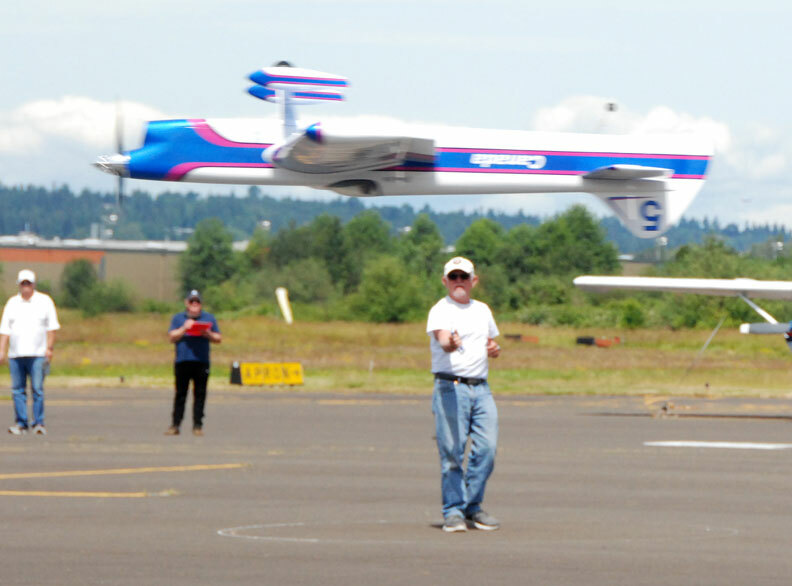 Howard Rush puts in an official flight in Expert Precision Aerobatics, with judges Addis Elmore (left) and Pete Peterson watching. Flying Lines photo. Rush's Impact in flight. Flying Lines photo. 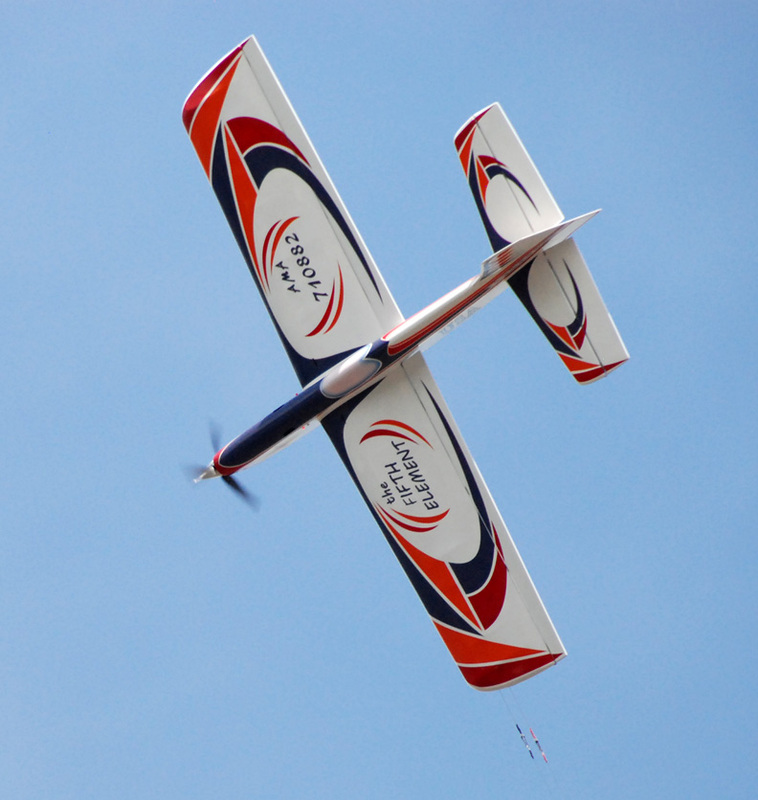 Mike Haverly makes an inverted pass with his Fifth Element in Expert Precision Aerobatics. Flying Lines photo. The Fifth Element in the air. Flying Lines photo. 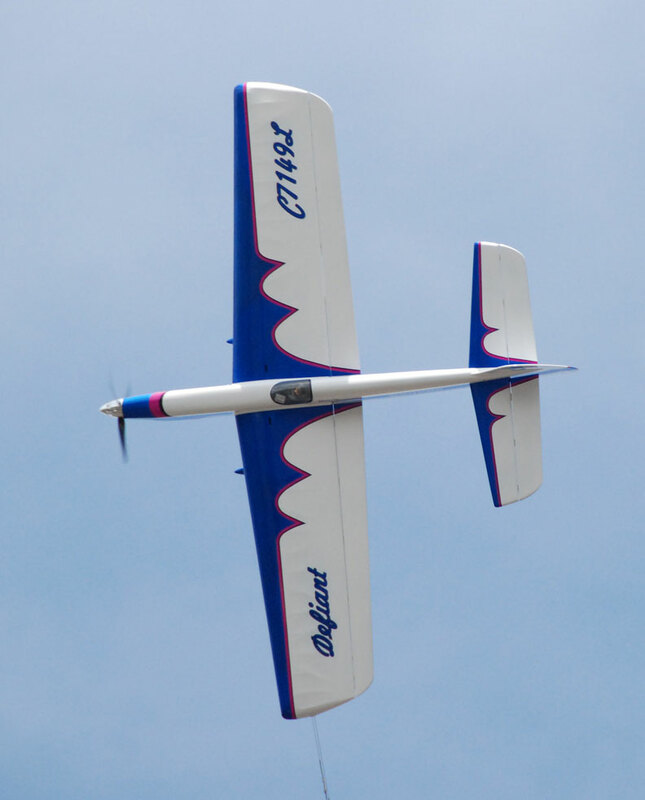 Chris Cox makes the second-place flight in Expert Precision Aerobatics. Flying Lines photo. 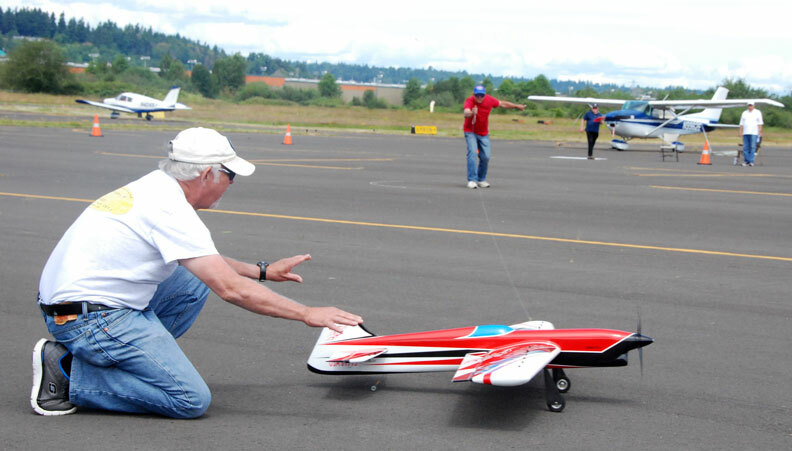 The Defiant in the air -- it was the Concours winner at the 2016 Northwest Regionals in May. Flying Lines photo. The Defiant captured on the glide. Flying Lines photo. Howard Rush's Impact awaits action it his service stand, while Mike Haverly's Fifth Element makes an official flight in the background. Flying Lines photo.